I was craving Mexican food and wanted to make something that my meat eating boyfriend would also appreciate so decided to create my own version of a Baja style “fish” taco…only of course without the fish. A New Twist on "Fish" Tacos! Mix miso paste, 2 tbsp olive oil, lemon juice and salt and pepper in a small bowl. Use a little more than half of the mixture to coat the shredded cabbage and set aside. Heat 2 tbsp olive oil over medium heat. Add onion and saute until translucent. Add mushrooms, kale and cook for about 2-3 minutes or until tender. Add the remaining miso mixture and cook until liquid is absorbed. Heat the tortillas and shredded cheese until melted. Meanwhile, warm and crumble the Sunshine Burger. Add the veggie mixture, sunshine burger, and cabbage to tortillas and top with salsa, hot sauce, lime, sprouts or whatever else you want! 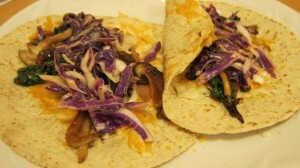 This entry was posted in Dinner Recipes, Recipes, Sunshine Burger recipes, Vegan Recipes, Vegetarian Recipes. Bookmark the permalink.